Raw gemstones framed with oversized bezels create a naturally beautiful silhouette in these luxe earrings. Throughout history, the ruby has been prized as a talisman of passion, protection, and prosperity. Today, large, fine rubies are rarely found in nature, and as a result these deep-red beauties are notoriously expensive. Scientists in California bridge the gap between science and nature by growing these gorgeous gemstones in a laboratory using the same materials found in nature. 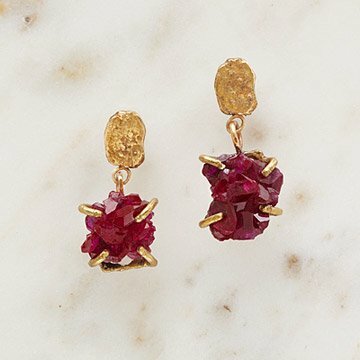 New York City-based designer Emilie Shapiro elevates bewitching, sustainably made rubies by setting them in bold recycled brass bezels that emphasize the stones' long-cherished beauty. Handmade in New York City. Make it a set! Pair with the matching ring and necklace. These earrings are very versatile and unusual. Beautiful color! When the earrings came they were all dusty, but the quality was good.